If you follow my Instagram stories, you’ve seen me make this vanilla smoothie almost every single morning for the last few weeks. I’ve gotten so many messages asking for the recipe, so here it is! 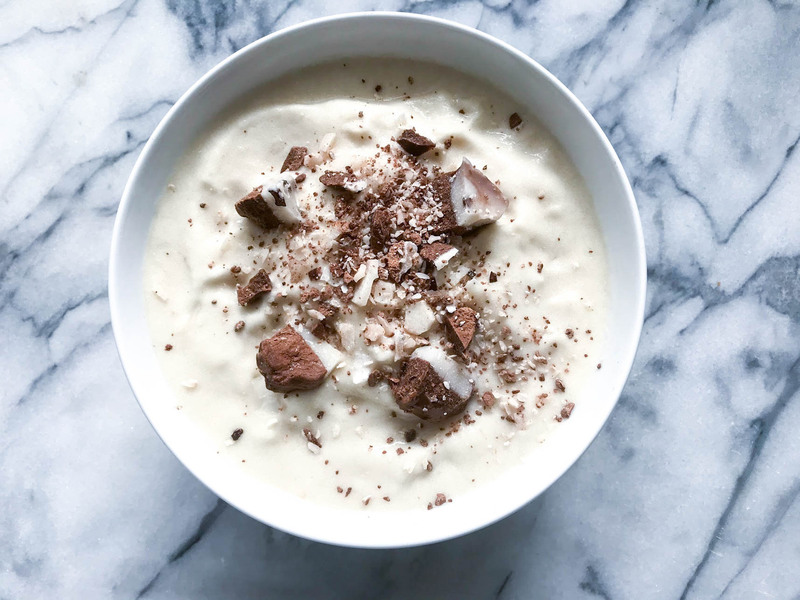 This smoothie bowl / milkshake is so quick and simple, and I cannot get enough of the texture and taste. If you’re obsessed with vanilla like I am, you’ll love this! I have to admit – when a smoothie (bowl) looks good, it tastes even better. There’s something about an all-white smoothie that makes it taste extra delicious. The consistency of this smoothie is thick and creamy, like a milkshake, except this is obviously much healthier. It even contains veggies! If you’re looking for a delicious fruit-free, low-carb smoothie to add into your routine, I highly recommend giving this a shot. It tastes like dessert to me! Imagine a vanilla milkshake, a smoothie, and cake batter all combined together in one bowl. That’s what I think of when I eat this. The key to getting the texture right is to add only the amount of liquid necessary to get the ingredients to blend – don’t overshoot the liquid. It ends up being about a cup for me, but I suggest working up to it. 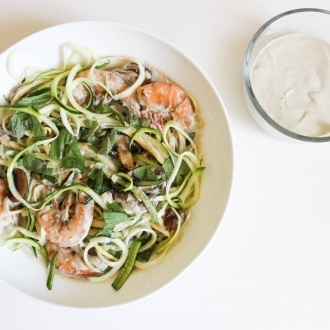 You can always add more, and different blenders works differently. 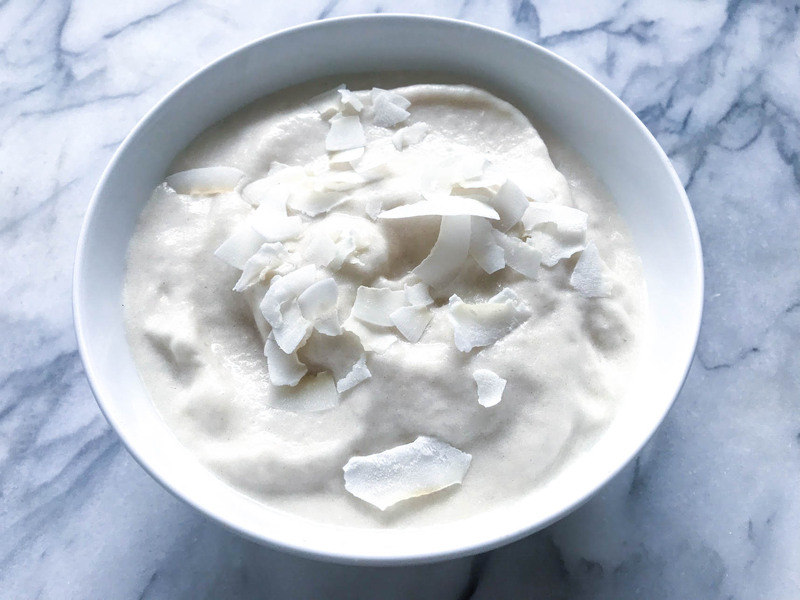 With my blender, I actually like to start off with just a handful of cauliflower and some nut milk, blend that together, and then slowly add in the rest of my ingredients. 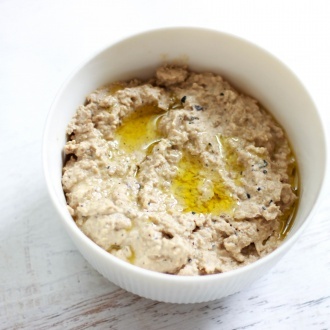 The texture might also change depending on the source of protein you use. 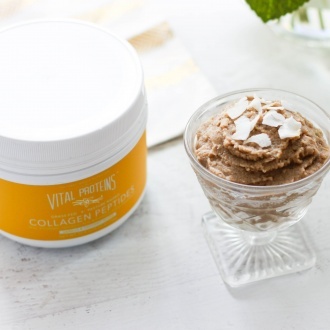 Protein powders tend to make it thicker and fluffier with a more “whipped” texture, but the collagen works great too. I tend to rotate between collagen and protein powder (I personally like this vanilla protein powder). There are also things you can do to enhance the flavor of this smoothie bowl / milkshake. The more ingredients you use with vanilla in them, the stronger it will taste. For example, rather than use regular almond milk, I like to use vanilla almond milk from Malk or Three Trees. With nut milks, always double check your ingredients, because many companies add sugar into any vanilla-flavored nut milks, which you want to avoid. Malk and Three Trees don’t add sugar into their vanilla almond milks, which is why I like them so much. 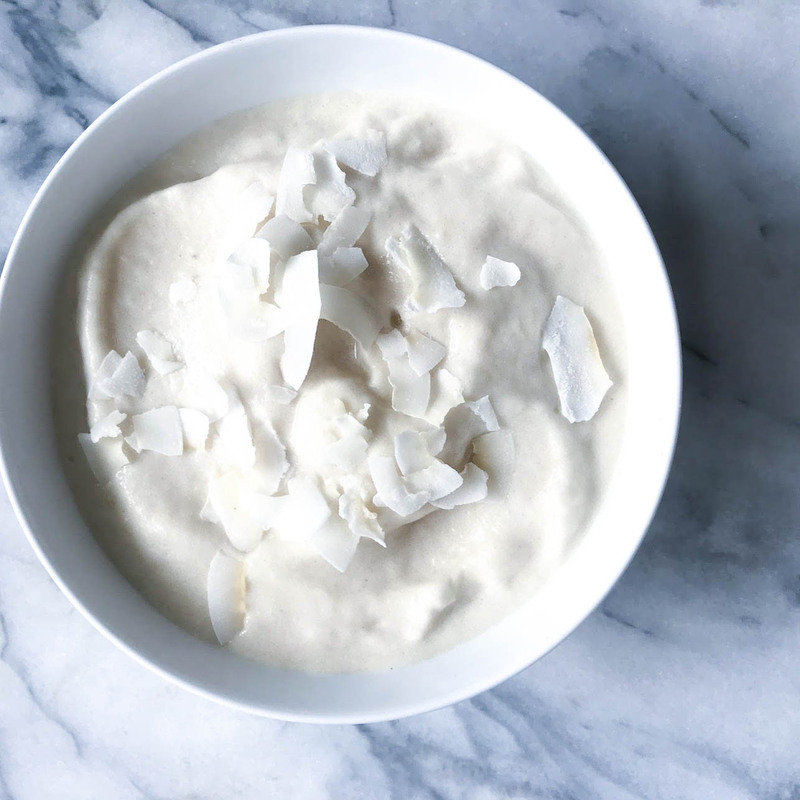 If you use a vanilla-flavored protein / collagen source, then you won’t need to add as much vanilla bean as you’ll need to add with an unflavored protein / collagen source. 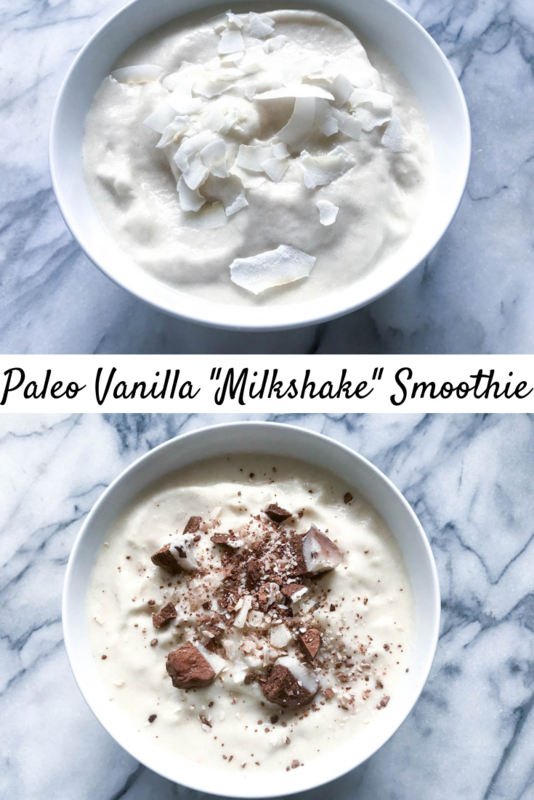 If you’re going with an unflavored protein or collagen, you might need to taste test as you go and just add as much vanilla as you prefer to get the desired flavor! I always use a vanilla flavored protein powder / collagen when I make this, because I like it to taste as vanilla-ish as possible. Not sure if that’s a word, but it’s happening. You can add in spinach if you want some extra greens, but it will of course change the color! Also feel free to add in ice if you want. I don’t usually add in ice because it can water down the flavor, but I know some people like ice for the thickness. The best part of a smoothie bowl is always the toppings, and I always like to switch up what I use. 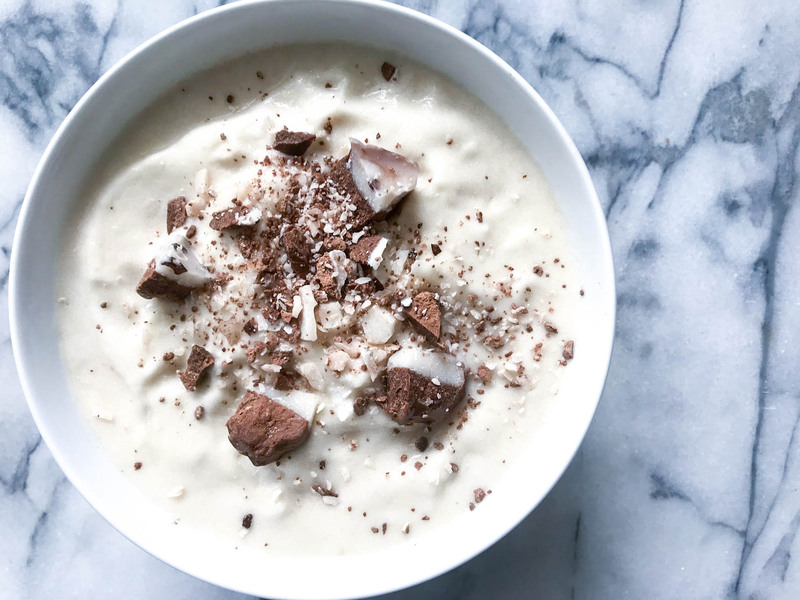 I almost always drizzle melted coconut butter on top, and then I like to add coconut flakes, one of my sugar-free desserts crumbled apart, Barukas, or some combination of those. Get creative! This smoothie tastes like a “light” milkshake to me, and when you get the ratios right, you’ll be amazed at how perfect the texture is! 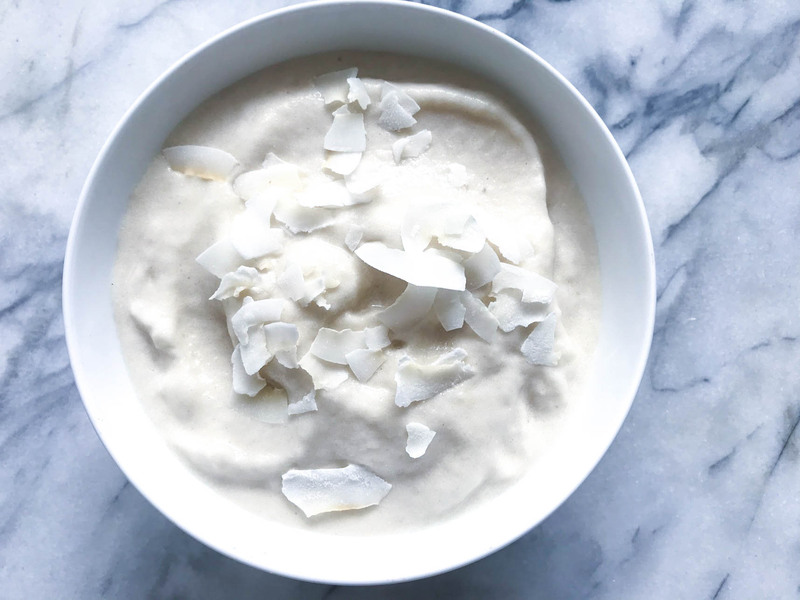 Don’t be afraid to increase or reduce the amount of cauliflower, vanilla, or coconut butter to meet your preferences. 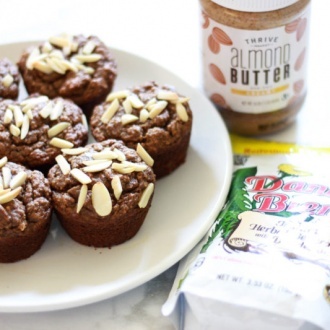 This recipe is paleo, low-carb, keto-friendly, and can easily be made vegan and nut-free, too! 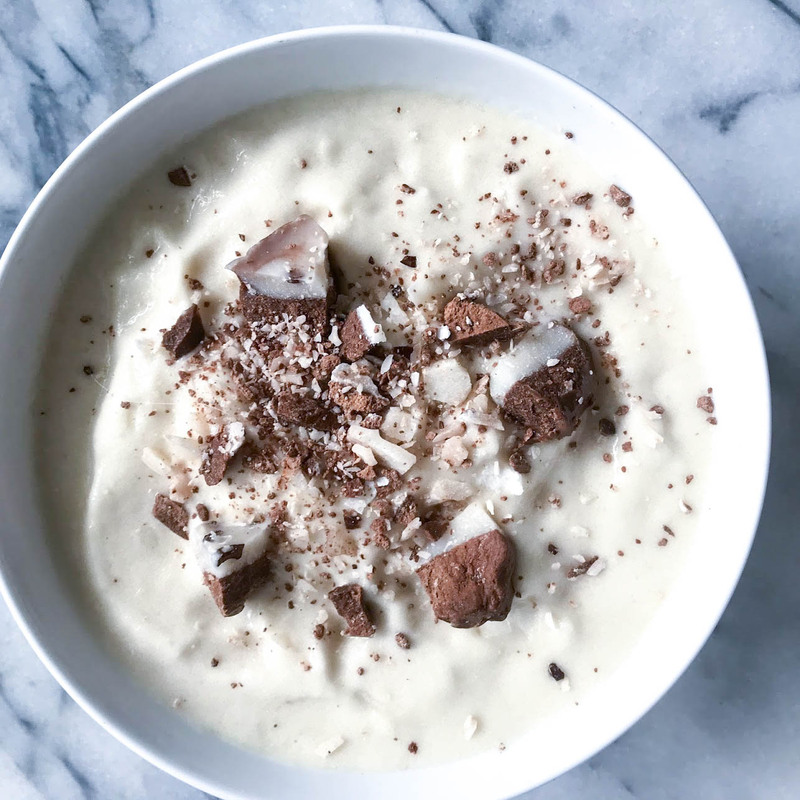 Options for toppings: coconut flakes, Barukas (my code “wellness” will get you 15% off! ), nut butter, sugar-free peppermint bark, cacao nibs, etc. Add all ingredients (except ice, if using) into a high-powered blender. Blend until smooth. If using ice, blend in the ice. Pour into a bowl or cup of choice.